FILE - Government spokesman Phay Siphan sits in the VOA studio in Phnom Penh in 2012. Cambodia's government has threatened to expel several media outlets, including the Voice of America, and is using U.S. President Donald Trump's criticisms of the press as justification. In a Facebook post Saturday, Phay Siphan, a spokesman for Cambodia's cabinet, threatened to "take action" against the media outlets, which he said are threatening the country's peace and stability. It appears to be the first time a foreign government has used Trump's treatment of the media as justification for its own censorship activities — something press watchdog groups have warned could happen. Trump has called press coverage he dislikes "fake news," referring to it as "the enemy of the people." Last week, the White House banned several organizations, including the New York Times and CNN, from an informal press gaggle with Press Secretary Sean Spicer. 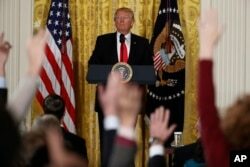 The White House argued it was trying to include more reporters in the event, however the action drew strong criticism from media outlets, which called it an insult to democratic ideals. FILE - Reporters line up in hopes of attending a briefing in Press Secretary Sean Spicer's office at the White House in Washington, Feb. 24, 2017. White House held an off-camera briefing in Spicer's office, where they selected who could attend. In his Facebook post, the Cambodian spokesman appeared to reference the White House's move to exclude certain media organizations from the gaggle, saying it sent a "clear message" that some journalists' reporting "does not reflect reality." "President Donald Trump thinks that the news reported by these organizations did not reflect the truth, which is the responsibility of the professional reporters," the spokesman said. "This means that freedom of expression must respect the law and the authority of the state." The spokesman specifically took aim at Voice of America and Radio Free Asia, both U.S.-government funded broadcasters, as well as the local Voice of Democracy, an independent, nonprofit radio station. Though Cambodia's constitution provides for a free press, most media are indirectly controlled by the state and closely monitored. The government of Prime Minister Hun Sen, who has been in power for three decades, has in the past criticized VOA and RFA, saying they were fomenting instability. FILE - Cambodia's Prime Minister Hun Sen waits in the hall of National Assembly before a meeting, in Phnom Penh, Cambodia, Feb. 20, 2017. In his Facebook post, Phay Siphan accused the broadcasters of being "foreign agents," and said they must "reconsider" their use of airtime before the government takes unspecified actions. The story was first reported by the Phnom Penh Post, an independent paper based in the Cambodian capital. After the warning was issued, the paper reached out to Phay Siphan, who said any media outlet that doesn't follow the government's orders would be expelled. "Shut it down. Very simple. Expel them," he said. In a statement, Jing Zhang, the acting director of VOA's East Asia Pacific division, rejected the characterization of VOA as a "foreign agent." "VOA is a media organization that reports news in an objective, fair and balanced manner," he said. "Millions of VOA listeners and Facebook fans in Cambodia can attest to our journalistic integrity." The U.S. State Department replied to VOA’s request for comment by saying, "The United States has long supported freedom of the press as fundamental to any democracy." But some human rights groups and ex-diplomats warn that it may not be the last time an authoritarian government cites the Trump administration's behavior as justification for their own press crackdown. "It's hard enough to be a journalist in dictatorships like Cambodia when the United States is setting a good example," Tom Malinowski, the former U.S. Assistant Secretary of State for Democracy and Labor, told VOA. "Now every dictator who wants to ban media he doesn't like can say, 'Trump does it so why can't I?'" said Malinowski, who served under former U.S. President Barack Obama. FILE - President Donald Trump looks at reporters during a news conference in the East Room of the White House in Washington, Feb. 16, 2017. In October, the Committee to Protect Journalists, a nonpartisan media rights watchdog, warned that Trump's presidency would represent an "unprecedented" threat to press freedom. "The consequences for the rights of journalists around the world be far more serious," said the CPJ statement. "Any failure of the United States to uphold its own standards emboldens dictators and despots to restrict the media in their own countries." White House officials have insisted that Trump respects freedom of the press, saying he is only fighting against what they see as unfair media coverage. Spicer, Trump's chief spokesman, on Friday defended his decision to bar several news organizations from the gaggle, saying he was only trying to include, not exclude, more reporters. "We had a pool and then we expanded it, we added some folks to come cover it," Spicer said. He later added: "We are going to aggressively push back. We're just not going to sit back and let, you know, false narratives, false stories, inaccurate facts get out there." VOA's Mony Say in Washington and Narin Sun in Phnom Penh contributed to this report.